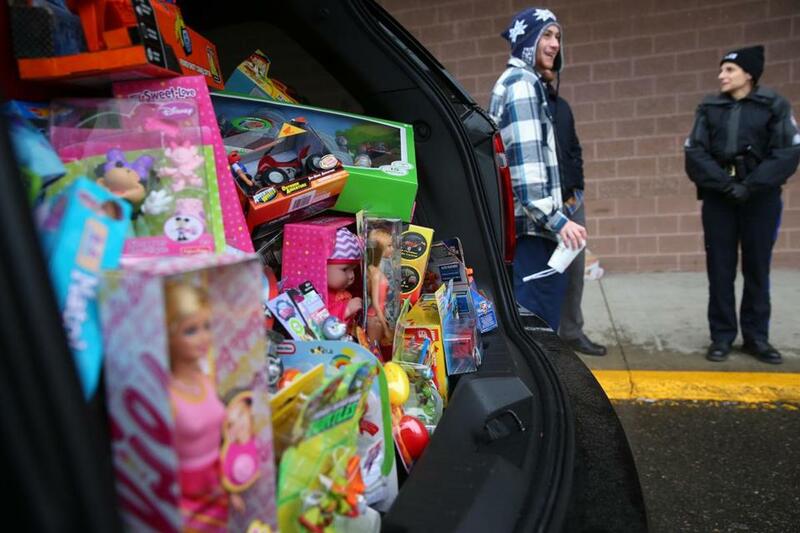 A toy drive in Salem during the holidays. At some point, you’ve probably watched “National Lampoon’s Animal House,’’ the 1978 John Belushi film that portrays college fraternity life as one big alcohol-fueled party. If the film’s wild toga party scene didn’t lodge itself in your brain, the image is constantly reinforced: Last year’s “Neighbors,’’ about a young couple unfortunate enough to live next door to an over-the-top frat, raked in $268 million at the box office. It’s not just American popular culture that constantly drags college fraternities and sororities through the mud. Frats nationwide — or simply, “the Greeks’’ for their use of that alphabet in branding themselves — seem adept at landing in it. Just last month, Philip Hanlon, the president of Dartmouth College in Hanover, N.H. — the school that reportedly inspired “Animal House’’ — banned hard liquor on campus and warned Greek organizations that if they didn’t improve their behavior, the school might ban them, too. Closer to home, four Boston University students spent several nights in jail in February 2014 after a frat party involved underage drinking. Last September, a Massachusetts Institute of Technology fraternity was closed for at least five years when a woman was hospitalized after falling out a window at a party. The adviser for Sigma Alpha Epsilon, one of the school’s two fraternities, is Salem State Police Chief Gene Labonte. But while recent media coverage about New England fraternities has conformed to the movie scripts, two campuses north of Boston have been quietly writing a new one about the resurgence in Greek life. Leaders of the groups at Salem State University and the University of Massachusetts Lowell said they are not about to start behaving badly now. The Greeks at Salem State have a real opportunity to design a brand-new model precisely because they are new. It wasn’t until 2011 that the first fraternity was introduced to campus. Now there are two frats and a sorority, with a second sorority due next fall. From what he has seen so far, said Michael Andrade, Salem State’s Greek Council program adviser, partying has not been the main thrust for the school’s fraternities. “I think [some students] just assume that’s the experience, and when they join and it’s not like that, they quit,” he said. Keenan added: “If that’s what people are going to think, I hope they take a minute to look at the community service and philanthropy we do.” Alpha Sigma Phi members have worked with the Northeast Animal Shelter and with the Boys & Girls Club of Greater Salem. “We do a lot of tutoring down there,’’ he said, “and play some pickup sports” with club members. The partying-to-productivity ratio varies from one Greek organization to the next, and can be all but impossible for outside observers to gauge. Salem State’s Greeks have hosted parties, and one brought trouble. Andrade, the program adviser, said raucous behavior at such parties can come from expectations brought by outsiders. On Sept. 30, 2011, someone attending a party at Alpha Sigma Phi threw a rock through a police cruiser’s windshield when officers arrived to break things up. The perpetrator was not caught, Keenan said, and the fraternity was left with a black eye in the first month the chapter launched. With about 70 active members, the sorority is larger than both fraternities combined. But while Salem State’s Greeks are working to establish an image, their counterparts at UMass Lowell are working to change theirs. In the fall of 2012, the Greeks were allowed back on campus for the first time in 25 years. They had been banned from conducting group activities at the school in 1987 after a fraternity hazing incident left a student near death. The student recovered from extreme overheating after being left near a space heater with a sleeping bag over his head, according to Globe reports. Since their revival at UMass Lowell, the Greeks have grown in membership from about 120 to 280. A crucial ingredient in their successful return, said Siegel, was the creation of a Greek Council, which was officially recognized by the university and made responsible for all the chapters. That structure is meant to hold Greeks accountable for one another. One serious incident involving what Siegel called “inappropriate initiation behaviors” occurred in a sorority its first year back on campus. The Greek Council, recognizing that Greek life was again in jeopardy, recommended the university remove the sorority from campus, and it was. “Since then, we have actually been incident-free,” Siegel said. “I’m not saying they’re angels,” but he said they had caused no more problems than other students. Meghan Gervais, president of Kappa Delta Phi sorority, said now that Greeks have had the opportunity to hold events on campus, it has dramatically changed the narrative of who they are. The Greeks often collaborate to host events and fund-raisers. Last fall, they recruited about 20 non-Greek groups to participate in an overnight event aptly named “Up ‘til Dawn.” They raised $17,000 for St. Jude Children’s Research Hospital. “I’m very proud of the Greeks,” Siegel said.